See your surroundings more clearly with BlueChart g2 data. 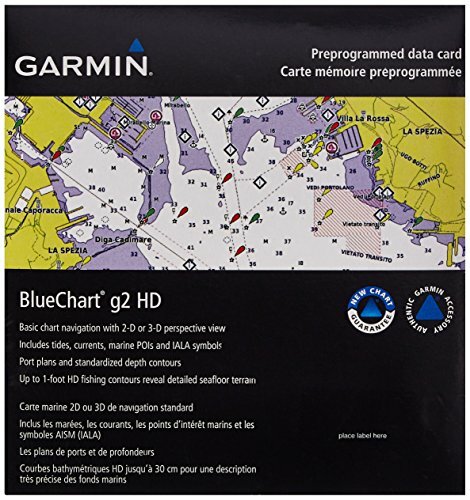 With BlueChart g2, you'll get detailed marine cartography that provides convenient viewing of nautical content. BlueChart g2 allows you to see your vessel's precise, on-chart position in relation to naviads, coastal features, anchorages, obstructions, waterways, restricted areas and more. You will also have access to detailed mapping capabilities that include Safety Shading, Fishing Charts, smooth data transition between zoom levels, harmonious transition across chart borders, and reduction of chart discontinuities. Choice of standard 2-D direct overhead or 3-D "over the bow" map perspective to make chart reading and orientation easier. Also compatible with Garmin's HomePort trip-planning software.